OnePlus has already confirmed that it is launching the OnePlus 5T this month and yesterday, the CEO and founder of the company explained why they are still keeping the 3.5mm headphone jack on the phone. From the pre-order listing to the official press render, there have been a lot of leaks related to the phone. Today, the phone was spotted in the wild, and this is for sure our first look at the OnePlus 5T in real life. 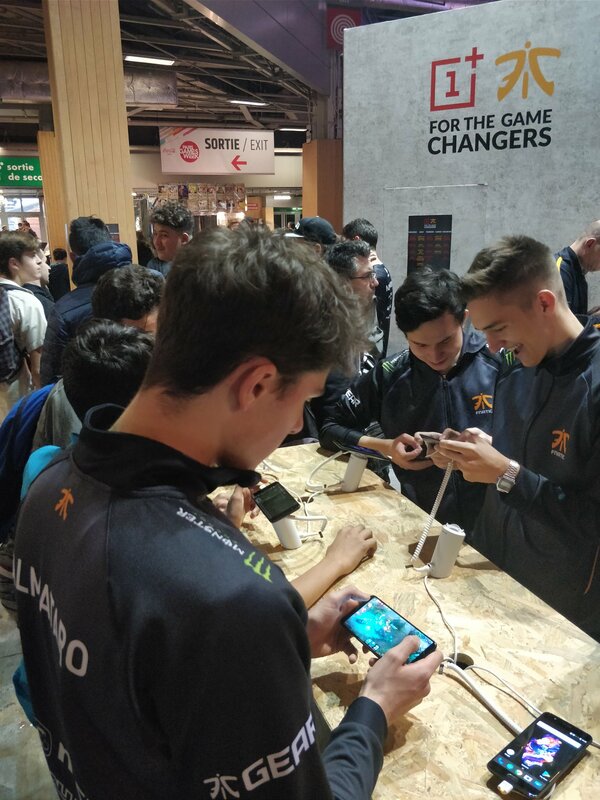 Coming to the leak about OnePlus 5T, at the OnePlus booth at the Paris Game Week (PGW), the Fnatic Players tried their hands on the flagships from OnePlus and we can see in the image above that one of the players is playing game on a phone with 18:9 display that is surely not the OnePlus 5. It is already known that OnePlu 5T is coming with an 18:9 display and this is our first look at the phone in the wild. Let’s hope to see some more leaks related to the phone. Till then, stay tuned to DroidHolic!